Free Falling, was my first thought looking at the album cover. Without a chute as well. The music of Island is a lot more on the safe side. A mix of 80s pop, think Deacon Blue, The Smiths indie rock, U2 delay, some 00s early Coldplay songwriting and all the echo and reverb a young aspiring band can find in a recording studio. Over it all put a singer with a rough, slightly pained voice and here's Island, a band of and for the 10s. Nearly every song is spacious. A guitar right, a guitar to the left and in between the bass and drums. The singer is right smack dab in the middle. All this leads to song that are devoid of all excitement. That might be different live where some of the explosions could potentially be earshattering, on record Island chooses to be on the safe side of the equation. Island is a band from London. After releasing two EPs, 'Girl' (2015) and 'A Place Like You' (2017) the band releases its first full length album. 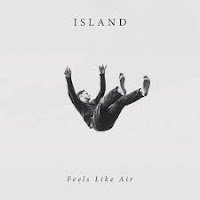 Island is singer Rollo Doherty, guitarist Jack Raeder, bassist James Wolfe and drummer Toby Richards. Together they have made Feels Like Air in a totally DIY style. Although the album might have benefited from some outside scrutiny, there's no doubt that Island must have succeeded in what it aspired to. Feels Like Air is a stronghold of consistency. Including a staple like the title song that really takes everything out of the basic idea. The slow moving song plays the two guitars off against each other. while Doherty studies the freckles on a face. The climax is the instrumental part where the guitars never go over the top. The moment one threatens to do so, the songs ends. This is building suspense into a song. It all ends with a reminiscence of the bedroom project Island once was, a few years ago. 'Lilyflower' reminds me of the folk songs of Nick Drake. An acoustic guitar and a, very different, voice to Drake's. 'Lilyflower' shows that Island could have more faces if it wanted to. Successfully to. Starting the album again I hear the word radio. It takes me back instantly to that great hitsingle of the early 80s 'Listen To The Radio (Atmospherics)' by Tom Robinson Band. Not just the word, the voice and sound as well. 'Ride' is a lot of things. Like more songs on the album are. I am sure that there are a lot more influences that can be mentioned here. Your section can be added below. Strangely enough I like Feels Like Air better every time I play it a second time in a row, let alone a third time, as I have because I want to end the review positively, like I end a listening session with album. Each time I notice how pleasant it makes me feel, while each time I am slightly disappointed when I put it on again. Like air slipping through my fingers. Feels Like Air is not the next big thing, no matter what BBC One claims. It is a fine album though with a lot to listen to and a lot to discover.